Combine the flour, eggs, and salt in a bowl and mix to make a pasta dough. Add a little warm water and knead until it has a firm but elastic consistency. To make the filling, melt the butter in a skillet and fry the bacon with the onions until both are translucent. Combine the bacon mixture with the sausage meat. Moisten the hard roll in water, press dry, and put through a meat grinder (a food processor would also work), along with the bacon mixture, cooked spinach, ground meat, leftover roast, etc. Then fold in the eggs, parsley, and seasonings; mix together. On a board that has been sprinkled with flour, roll out the dough into rectangular sheets (about twice as wide as you want your ‘Maultaschen’ to be). Take a tablespoon measure and put little dabs of filling at equally spaced 3-inch intervals all down the middle of one side of the sheet of dough. Mix together the egg and canned milk and apply it to the spaces in between the outer edge and the fold line. Fold the plain half of the sheet of dough over to cover the filling, press down firmly on the spaces around the little packets of filling, and use a pastry wheel or knife to separate the packets into 3-inch square or diamond- shaped ‘Maultaschen’. 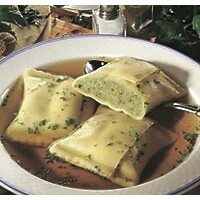 Cook thoroughly in beef stock or boiling salted water for about 10 to 15 minutes, depending upon the size of the ‘Maultaschen’. When they rise to the surface, drain thoroughly before serving. Optional: Slice one or two onions into thin slices, fry in butter until golden brown and empty the contents of the skillet over the ‘Maultaschen’ on the serving dish. my 90 yr old German father made these for Christmas and they were great. very comparable to what we had in october 2011 in Heilbronn, Germany. It has become a new tradition in our home. He stated to make the filling first then the dough.